Where the employee provides their PPS number the provisional tax credits and standard rate cut off point are to be granted. It is important to note that where an employee has separate periods of employment with one employer in one income tax year, to which the emergency basis applies, the employment is deemed to commence at the start of the first of these periods and continue to the end of the last period of employment or 31st December whichever is earlier. 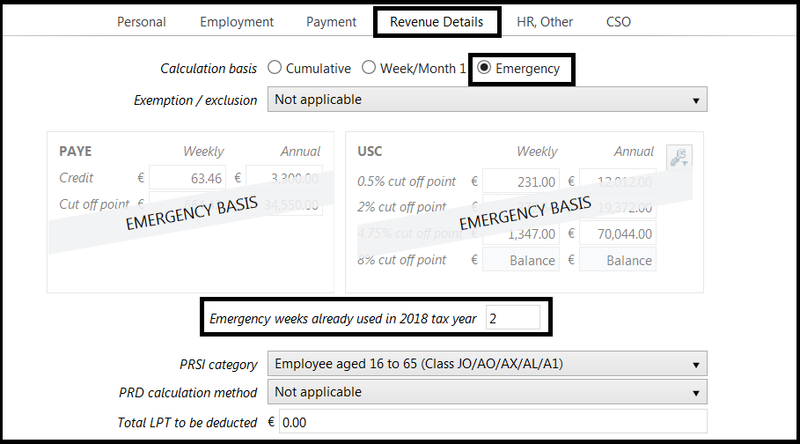 The entry of the number of weeks has no effect on insurable weeks etc, it simply indicates where the employee is in terms of the previously used portion of emergency basis tax credits and SRCOP, remember these can only be allocated once within the tax year.